You’re at the store shopping and your first-grader sees a toy they want. “You have to have money to buy that,” you say. “What’s money?” they reply. If your child is old enough to ask that question, it’s time to talk to them about the value of money. 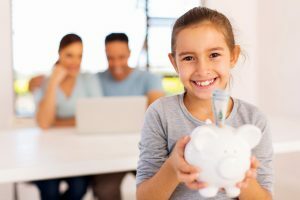 Talking to your children about money and explaining how it works instills important values like patience, planning, delayed gratification, and impulse control, all of which are beneficial, both now and later on in life. Starting around the ages of five or six, children start to develop the cognitive skills necessary to understand the concept of money. When they’re ready, explain that money is something you get in exchange for work, and that the bank or ATM is where you keep your money until you’re ready to use it. 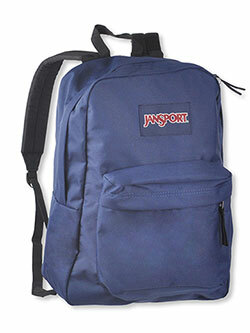 Talk about how you can only spend as much money as you have in the bank, so you have to spend wisely. Beyond the simple explanation of money, you can keep the conversation going with some fun activities. If you have a spare change jar at home, take a few minutes every day to count the coins and exchange smaller ones for big ones. Set up a mock store in the kitchen by pricing items with sticky notes and giving your little one a set amount of money. 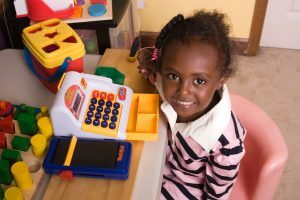 These kinds of role-play situations will help kids become familiar with counting money, making change, and deciding how much money they have to spend. Games like these also reinforce math concepts – an added bonus! Giving your child an allowance is a great way to help them develop financial literacy. Make sure that the amount is just a few dollars or enough for them to buy small items. Then, the next time you go out shopping tell them to bring their allowance in case they want to buy something. Most experts agree that tying a child’s allowance to chores can lead to resentment, because children should help out around the house without compensation. For this reason, think carefully about whether or not your child’s allowance is related to chores and good behavior. If a child wants something that costs more than the amount they have, explain to them that they’ll have to save their money and they’ll be able to buy what they want at a later date. Patience is what you should aim to teach them. If they throw a tantrum and you give in by purchasing what they want, they’ll learn that that kind of behavior is okay. It’s not. It may take some time, but by being open with your children about the value of money and encouraging them to think about what they’re spending it on, you’re helping them become better decision-makers and instilling values that will last a lifetime.